Dr. Jim Walker received his Ph.D. in Biochemistry from the University of Cambridge and carried out post-doctoral training at Massachusetts General Hospital. 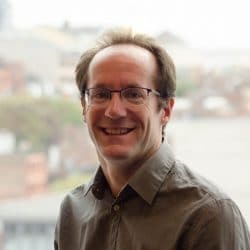 His research focuses on understanding the genetics and molecular mechanisms underlying neurofibromatosis type 1 (NF1) and schwannomatosis using both animal (Drosophila) and human cell models. What are the genetic modifiers of neurofibromatosis type 1 (NF1)? 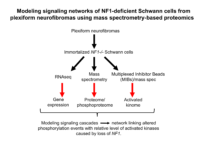 Which signaling networks are affected in NF1-deficient tumors and how do they respond to potential therapeutics? We have conducted a genetic screen using a Drosophila model of NF1 to look for dominant modifiers of the dNf1 pupal size defect. Initially we screened deficiencies on the 1st and 2nd chromosome that uncover 80% of annotated genes. 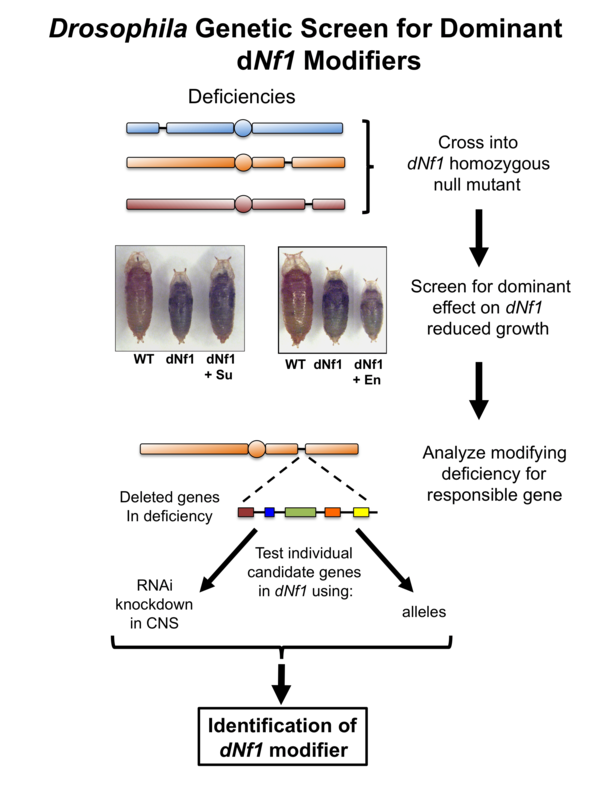 We subsequently identified responsible genes in crosses with mutant alleles or by tissue-specific RNA interference (RNAi) knockdown. 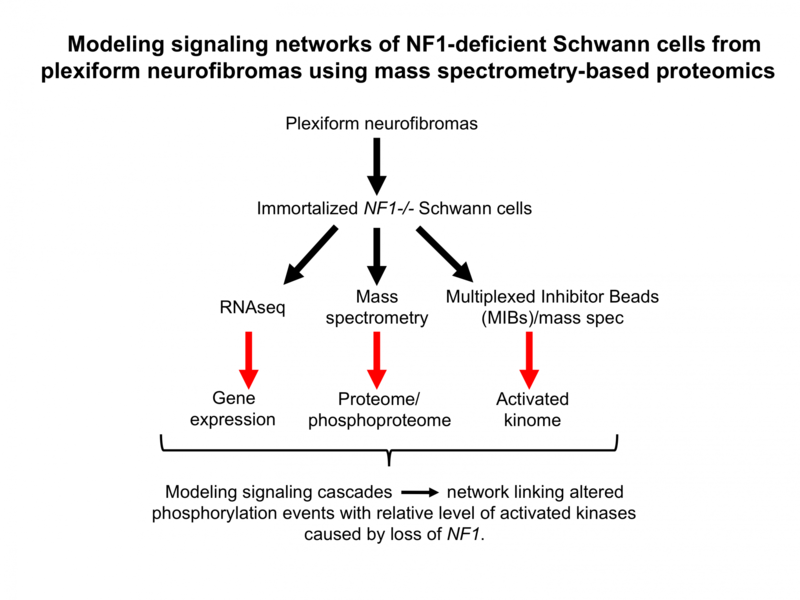 We are using two complementary mass-spectrometry-based approaches to define (i) the proteome and phosphoproteome and (ii) the activated kinome signature of NF1-deficient Schwann cells (SCs) derived from plexiform neurofibromas from patients with NF1. Together these data sets will provide a detailed view of the cellular signaling networks and the molecular targets controlled by neurofibromin in a cell-type relevant to the disease. Small molecule inhibitors to both known and novel signaling pathways will be used to examine the adaptive kinome in treated cell lines. Patient mutations causing NF1 have been identified throughout NF1­ gene – not just within the segment known to control Ras. We hypothesize that investigating these mutations may give a clue to the diverse clinical symptoms and the variable nature of NF1. 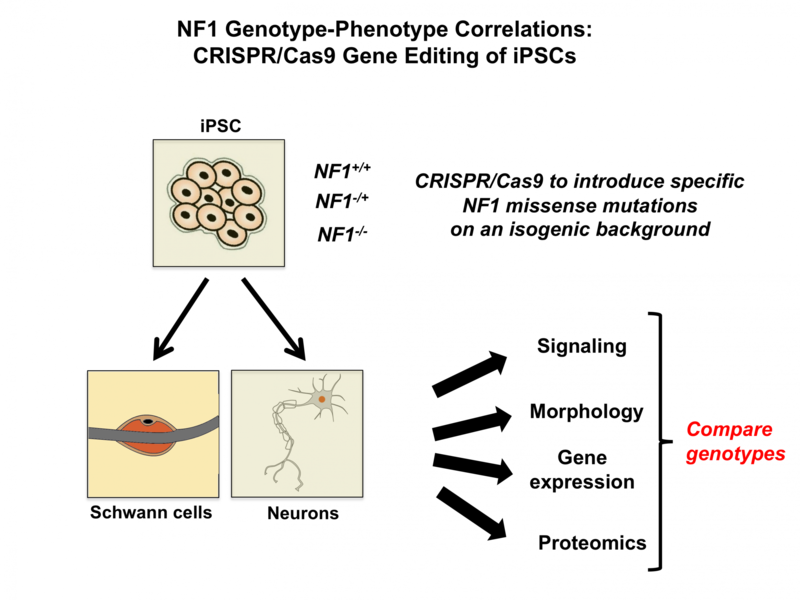 We are using CRISPR/Cas9 gene editing to generate selected mutations in human induced pluripotent stem cells (iPSCs). 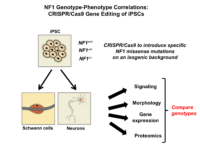 These iPSCs will be differentiated into neurons to examine neuronal morphology, proliferation, signaling and electrophysiological properties to look for correlates with specific mutations in different regions of NF1. 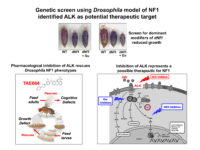 A genetic screen for dominant modifiers of dNf1 growth identified suppressors include the tyrosine kinase, dAlk and its activating ligand, jellybelly (jeb). Additional experiments have shown that NF1-regulated ALK/RAS/ERK signaling is conserved in human cells. 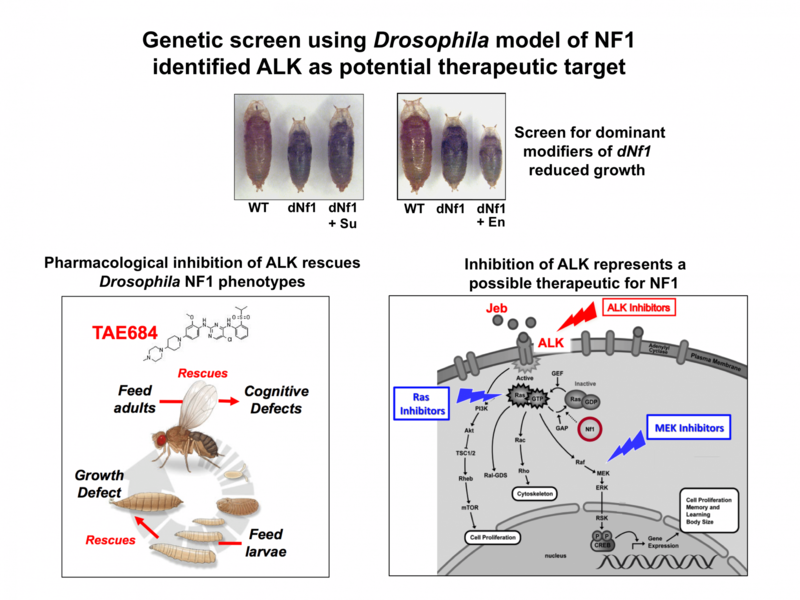 ALK represents a potential therapeutic target for treating the effects of NF1 deficiency in neurons.